The ‘peacenik’ President heeds a call to arms – but is it too little, too late? THERE must be an awful lot of soap being used up in the White House and Whitehall, as ministers and their minions try to wash their hands of Iraq. And I bet the label on each bar is stamped, ‘For ditherers only.’ If not, they should be. Because the great brains of Western diplomacy haven’t a clue whether to stick, twist or chuck in their hand and allow violence to take its unnatural course in sorting out the latest Middle East imbroglio. Various military acronyms rooted in WW2 slang – like FUBAR and SNAFU, whose meanings I won’t spell out for fear of upsetting those of a sensitive disposition – spring to mind as pertinent descriptions for the plight of those whose indecision may, or may not, be final. And at the very top of the pile of confused, anguished hand-wringers is an American leader, whose default setting is to gaze at his navel, as if answers to the world’s ills miraculously lie within the lint of his belly button. In 2008 Barack Obama was elected President on an anti-war ticket, redolent with slogans ranging from ‘Hope’ to ‘Yes We Can’ (whatever that meant). The following year he was awarded the Nobel Peace prize, based not on deeds, but the same windy promises that shoehorned him into office. Even the man himself was flabbergasted. Over six years later his main achievements of note have been extricating his gung-ho predecessor, George W. Bush’s ‘Coalition of the Willing’ from Iraq and downsizing troops in Afghanistan, with the aim of every Crusader GI quitting by New Year. But, given the daily evidence of mounting carnage afflicting both rudderless states, there’s little to embellish Obama’s legacy, except for taking Hillary Clinton’s advice on obliterating Osama bin Laden. Meanwhile, even starry-eyed optimists recognise it’s only a matter of time before the untamed Taliban return to Kabul and fill the void created by the exit of NATO troops. An even more alarming spectre haunts Western policy-makers over the future of Iraq, where a sectarian strife has erupted in all but civil war, as murderous Sunni fanatics of the Islamic State of Iraq and Syria, ISIS, mop up the oil-rich hinterland and threaten Shia-dominated Baghdad. It’s futile to rake over old coals, as former British leader Tony Blair recently did in justifying the 2003 invasion/liberation of Iraq, because history is already writ large, though it was always received wisdom the country would be a powder-keg for decades. That it has exploded so ghoulishly is largely due to the ineptitude and arrogance of Nouri al-Maliki, the Shia Prime Minister, who ethnically cleansed Iraq’s government, army and civil service of virtually any Sunni and Kurdish influence. Even if the nation’s religious demographics gave Shias a 65% majority, the vision for a democratic, post-conflict Iraq was intended to be an inclusive one, with a modicum of power-sharing. Now, stability exists only in far-north, autonomous Kurdistan, while the rest of the country seems damned to imitate next-door Syria and descend into a sectarian bloodbath. 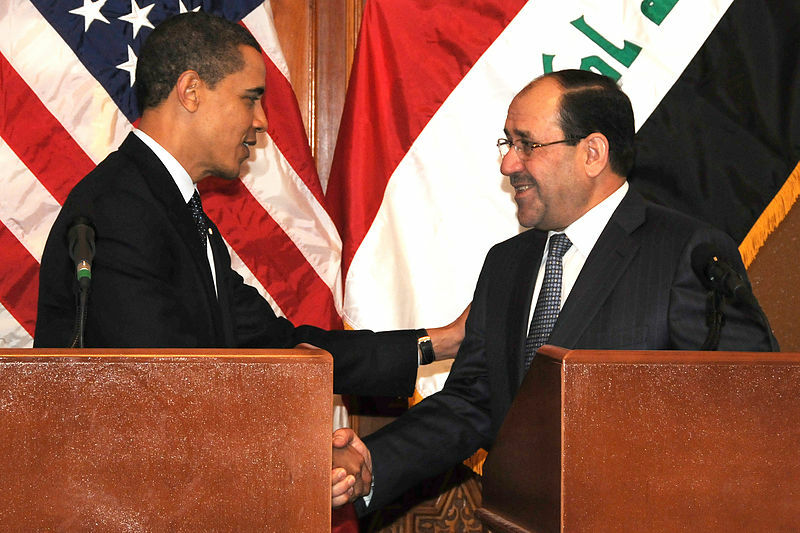 That the blinkered Maliki was stupid and overcome by megalomania is beyond doubt, despite having a democratic mandate. But, as his paymaster and sponsor, Obama – for all his aversion to confrontation – should have had the wit to nip the shameless power-grab in the bud and read the riot act to the idiot of Baghdad much earlier. Hence, now we see a battle-fatigued America being re-drawn into the conflict, after the President announced on Thursday 300 special operatives would go to Iraq and ‘provide technical support’ to help overcome ISIS, after Maliki pleaded for US intervention. Talk about déjà vu all over again! Meanwhile, how much difference 300 specialists can make – and whether they are too little, too late – is debatable, as is Obama’s vague threat of force, ‘if intelligence recommended it’. But, at least, he took a sideswipe at the Iraqi leader, underlining the error of his ways. Nevertheless, it bode ill for the 44th President, who’s hardly put a foot right dealing with crises on foreign fields since his election. He and his diplomatic corps at the State Department – situated in aptly-named Foggy Bottom – utterly misread the runes of the Arab Spring, ignominiously backtracked over the ‘red lines’ warning to Syria’s butcher, Assad, tried and failed to arm-twist allies Israel into a one-sided peace deal with the deceitful Palestinians and contracted the ousting of Libya’s lunatic, Gaddafi, to France and the UK. To add to his litany of follies, Obama has practically given Iran a free pass on its nuclear ambitions and allowed Vladimir Putin to run rings round him over Ukraine. Rarely – if ever – has a US commander-in-chief commanded so little respect on the world stage, now a far more parlous place for his ineptitude and dithering. The very real and present danger is that matters threaten to grow rapidly worse, because not only does ISIS make Al-Qaeda appear pussycats, their manifesto is to export terror worldwide, once they’ve established a Sharia caliphate across a swathe of Syria and Iraq. The irony of all ironies is only one nation has sufficient military and diplomatic muscle to halt their charge and lift the West off the peg it’s impaled upon: Iran. 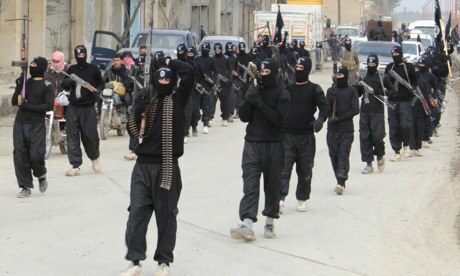 Through its religious ties, only it has the ears of Maliki and Assad, whose Alawite sect is a Shia offshoot. However unedifying, the notion of Tehran’s terror-mongers and ‘The Great Satan’ of the USA finding common cause is increasing from possibility to probability, as back-channel chatter between the two is said to be buzzing. If a US-Iran alliance does come to pass, though, any slender hope of Obama leaving a legacy of a peace-maker president will be forever tarnished. No wonder they’re busy passing the soap in the White House and Whitehall. They gather in august conclave, preening princes in sumptuous, flowing robes seated beside elegantly-tailored tyrants and military strongmen, clad in uniforms so adorned with medals, they’re in danger of keeling over. They pose, ponder and prevaricate – fudging issues appears to be their natural inclination – before ending the charade of unity with a sabre-rattling declaration that is as worthless as the paper it’s scrawled on. 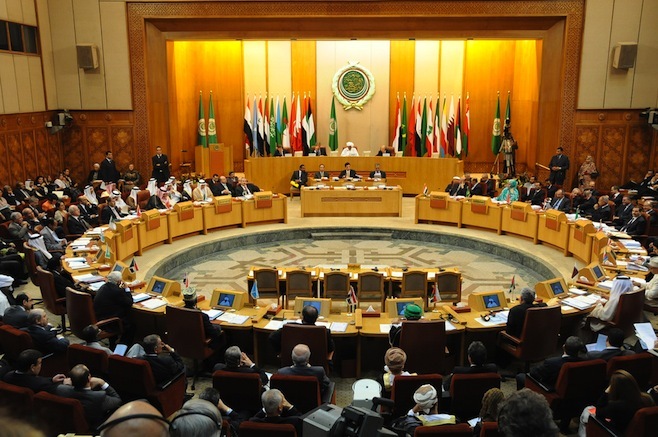 This is the Arab League: 21 nations, covering 13 million square kilometres, ranging from Mauritania, on the Atlantic coast in the far west, to Oman, whose shores are lapped by the Arabian Sea in the extreme east. Sandwiched in between are the ‘super powers’: Egypt, Iraq, Saudi Arabia and – until its suspension two years ago – the odious Al-Assad family fiefdom of Syria, a pariah state even by the Middle East’s appalling standards of disregard for basic human rights. The League represents over 400 million people, although ‘represents’ is a misnomer, since the overwhelming majority of Arabs have not an iota of democratic influence on whatever their monarchs, dictators or military juntas discuss, decide or do. The members’ authority within the organisation varies according to its wealth or size of populace. Oil-bejewelled Saudi and the Gulf emirates, for instance, wield enormous political muscle, while Egypt – whose 85 million inhabitants make it the region’s most populated nation – was the crucible of militarism, until the ructions of the Arab Spring/Islamic Winter. Until this day, these noble goals have achieved little to say the most. And, apart from the largesse heaped by the petroleum realms on their citizens to buy obedience, the League has demonstrated such manifest incompetence, it couldn’t douse a fire in a matchbox. In short, the League is a travesty of self-interest. It is an exclusive club of despots, whose sole purpose is to retain power, exert disproportionate sway over the oil-buying West – especially in that chamber-pot of irrelevance, the United Nations – and disregard the just aspirations of their peoples. And Europe, the USA and Russia are – and have been – complicit in helping this disassembly of autocrats to continue and prosper. First, Britain and France carved up the Middle East into artificial states in the wake of World War One, the British imposing foreign monarchs – think Jordan and Iraq – on disparate clans and tribes, with nothing in common, except perhaps, timeless vendettas and religious animus. Secondly, with American foreign policy designed to check the power of Russia, the West armed the Arabs to the teeth – as it continues to do, with abiding ignorance and negligence – propping up regimes, whose values are crudely medieval. And, for all its pretentions to solidarity, the bickering, back-biting League can agree on only one topic: the annihilation of Israel and the legitimate Jewish state’s replacement by a Palestinian entity, with the iffiest historical claims to territory. Three major wars – in 1948, 1967 and 1973 – ended in ignominy for the Arabs. But, instead of seeing the massive peace dividend from an accommodation with the ‘can-do’ Israelis, too many of the League’s tyrants remain obsessed with maligning it on the world stage, indulging in the crudest anti-Semitism, and funding extremist terror. For decades, the counterproductive tactic of using the one nation in the neighbourhood, where Arabs enjoy freedoms that are non-existent in Arab countries, was a highly convenient sideshow that worked a treat. The so-called Arab Street was hypnotised and propagandised into believing the Jews were the font of all their ills – poverty, lack of education, joblessness and general deprivation. Not any longer. The advent of the internet, which even local tyrants can’t suppress, has opened up a window of enlightenment and a kernel of hope is taking root in a desert of human despair. Repressed people everywhere can read Western opinions that don’t kow-tow to their governments, learn of liberties, of fundamental rights enshrined in laws, of progress and opportunity, not forgetting the benefits, responsibilities and challenges of democracy, warts and all. So, regardless of whichever brand of Islam, Shia or Sunni, they subscribe to, awareness is growing – as demonstrated in Egypt, Syria and Tunisia – and it is becoming apparent to many Arabs that the reason for their third-class lot is not Israel. This slither of land the size of the state of New Jersey being populated by a born-again nation with a biblical imperative to be there may be a thorn in Arab pride, but the rapacious lust for power and greed for riches of their masters is the true reason they inhabit a lesser world. The genie is out of the bottle now and, as Syria’s Assad resorts to unimagined levels of barbarity in a civil war that began as a cri de coeur for democracy, the League’ impotency is exposed again for its ineptitude and self-interest. A half-hearted attempt at mediation in 2011 by Sudanese president, Omar al-Bashir – himself an alleged war criminal – flopped. So the League resorted to its default setting of wanting the West to sort out the mess by military means, just as it did apropos Mad Dog Gaddafi in Libya. The League – too timid and dysfunctional to allow its own forces to get their hands dirty – desperately needs some form of Western intervention, not merely to slap down Assad, but to send a blunt message to his puppet-masters in Iran, where the Armageddon-seeking ayatollahs continue their game-changing quest for nuclear weaponry. So, as usual, once again the Arab League is doing what it does and does best: leading from the back.